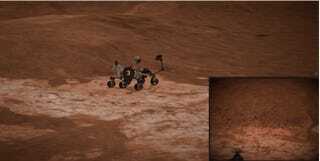 Explore Mars as the Curiosity Rover, Using This Handy Simulator! This new simulator lets you direct the Curiosity rover on its missions around Mars—whether you want to send it to drill into the dust, explore new terrain, or just catch it in the somewhat awkward position of capturing a selfie (like you see above). Oh, Curiosity, we’ve all been there. Experience Curiosity is a new program put together by NASA JPL, which uses footage snapped by the bot to re-create the Martian landscape around it. You can opt to switch between the various cameras as you move—or just stay still and get better acquainted with the mechanics of the rover itself, getting an up-close view of each one and its function. Test it out yourself right here.